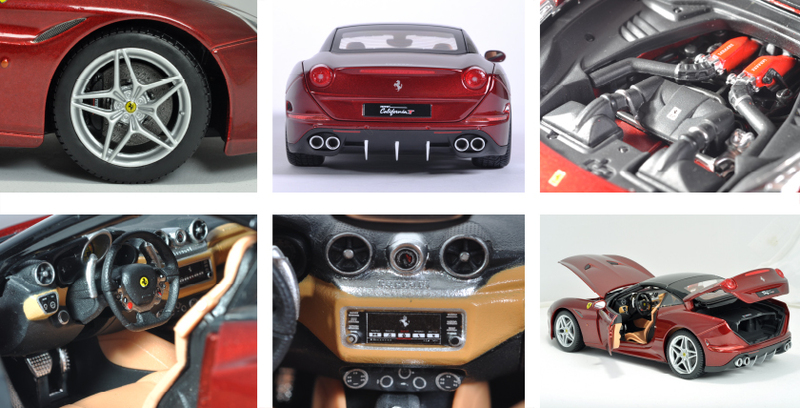 Hong Kong (March 2015)— The May Cheong Group (MCG), manufacturers of the famous die-cast and radio control replica brands Maisto and Bburago, has announced additional details and released photos of the company’s first products in the hobby‐grade replica Ferrari Signature Series line. The 1:18 scale Ferrari California T (closed top version) information has been made public, along with the first pictures of the replica. Bburago announced there would be almost 20 different enhancements to the Signature Series Ferrari California T (closed top version) from their already highly-­‐detailed Race & Play line. Some of the variations between the 2 brands are obvious to the eye, such as the Signature Series closed, red outer box with vehicle rendering and foil-stamping branding. On the vehicle itself, launch color Rosso California compliments the 20” forged diamond rims beautifully. Further details are highlighted in the photos below and the accompanying page.